The Bleecker Street school would be the white block in the upper right of this diagram. 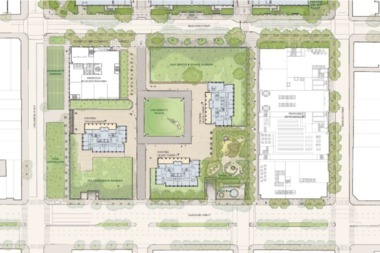 GREENWICH VILLAGE — The first phase of New York University's expansion in the Village is underway, according to a memo the university’s vice president for operations sent to the NYU community. The email message, sent Tuesday, said the university is beginning design and prep work for the eventual demolition of 181 Mercer St., where the Coles gym currently stands. The memo from NYU's Vice President Alison Leary and Arts Professor Laurence Maslon, the chair of the committee advising the school on the expansion, also says the gym will remain open "through at least Nov. 15" of this year. Architects working on the new building will use the second week of August to make "exploratory borings" inside and around Coles to get "sub-surface" information they need to plan the new building's design. Two architecture firms were selected for the new building earlier this year. Leary said in her memo that the architects are expected to present potential design plans for the new building by the end of this year. The school is only allowed to do work on one building at a time, which was one of the conditions that earned the City Council's approval of the plan in 2012. The expansion got a green light from the state's highest court in June, when opponents lost their final appeal in a multiyear legal battle against the plan. The school has also promised to find a new location in the neighborhood for the Mercer-Houston Dog Run, another site that will be affected by the expansion. Leary also informed the school community in her memo that the dog run is being relocated to the Rocket Ship Park along the northern side of Houston Street, west of the Coles gym.